First of all, many thanks to the Publisher for approving my request for an ARC via Netgalley. 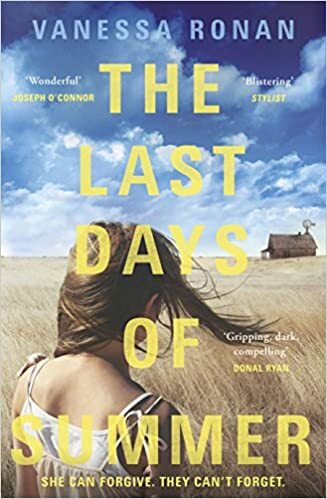 The Last Days Of Summer will be released on 5th May 2016. This book had my attention from the very beginning and held it until the very end. Not an easy read by any means, given the subject matter, but well written and thought provoking. I found myself wondering what I would do in the same situation. I guess you never know until you’re faced with such decisions. Jasper finds himself a free man after serving ten years in prison for a horrific crime. We’re not told what that crime is for quite a while though. There are hints along the way and you know it’s going to be horrendous, but you’re not quite sure. Jasper’s Sister, Lizzie, has decided Jasper should move back home with her as the house is half his anyway since their mother died. However, Lizzie has two daughters, a teenager Katie, and 11 year old Joanne. Everyone in the town thinks she must be mad to have him living with them, including the Vicar. She worries she might be making a mistake herself, but he is her brother after all. She doesn’t truly believe he would be a danger to her or her daughters, but hopes he doesn’t prove her wrong. She has given up on praying. Jasper insists he is done with trouble, but needless to say he isn’t welcomed back with open arms and it isn’t long before people are seeking their revenge. I thought I knew where the story was leading, as it’s obvious the town folk aren’t going to just get used to Jasper being back, but I was horrified by just how far they were willing to go to seek their revenge! I found this story gripping, quite disturbing in places, but also quite emotional. It’s a very descriptive book. I could totally picture myself sat on Lizzie’s porch, overlooking the prairie watching the sun set. I wouldn’t like to find myself in her shoes though. Vanessa Ronan was born in Houston and in her 28 years has lived in Texas, Mexico, New York, Edinburgh, and Dublin, where she now lives with her Irish husband. Among other things, she has been a dancer, a PA, a barmaid, a literature student, a dance teacher, and now, a writer. Home-schooled by her literature teacher parents, Vanessa began writing as soon as she learned the alphabet. The Last Days of Summer is her first novel. Previous Article Nominations for Bloggers Bash Awards Are Now OPEN! So glad to hear there is so much depth to this book – I have a copy so looking forward to finding out more for myself.